Once upon a time, Romeo said to Juliet, "that which we call a rose/By any other name would smell as sweet," and it would probably be just as popular of a tattoo too. The rose is a multifaceted tattoo that can be chock full of complex meanings depending on the elements, type, and color. Imagine you go into the tattoo parlor to get your first tattoo. It is a rite of passage taken by many young individuals. As you are looking through the flash to find your design, you stumble upon a rose. Something about it appeals to you, but you can't quite figure out what. Well, you wouldn't be the first, and you're definitely not the last. There is a wealth of culture in a rose design that comes from the history of the flower. First of all, the rose is a classic symbol that has been around for about 35 million years, according to fossil records. It can be found in the Middle East, Asia, Africa and beyond, but is most prevalent in American tattoo culture. Why is that? Because the rose can hold a plethora of meanings including war, peace, love, purity, beauty, and even politics. For example, Rose Magazine notes how the poet Anacreon linked Greek Goddess Aphrodite with roses of both white and red. Other mythological figures like Eros and Psyche are linked to roses as well. In Roman mythology, you can find Flora as the symbol of a rose. Additionally, in Christianity, you can find the rose to signify the Virgin Mary and the Garden of Eden. Now that you understand a bit of the history of the rose, its prevalence in the tattoo world might make a bit more sense. 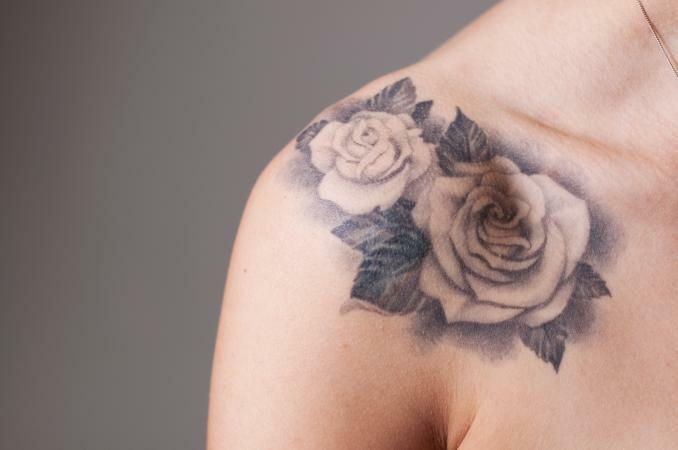 But how do you know which style of rose tattoo is right for you? The symbolism in a rose tattoo is really dependent on several different elements of the flower itself. One of the first things that people typically ask about is the color of the rose. As every gardener and tattoo artist will tell you, each different color holds significance that is traced back to the history of the flower. For example, a blue rose is unnatural and can mean mysterious or unattainable, while a purple rose can mean enchanting, bold or daring, and it is also the color of royalty. White roses can mean innocence, platonic love, and more. Therefore, simply the color of your rose can hold a lot of significance in the meaning of your tattoo, but it isn't the only element. Another symbolic element of a rose is the shape of the flower itself. When you see a tattoo of a rose bud, it typically represents a new beginning, youth or purity. It makes sense, this is the beginning of the flowers life, it is new and pure. The blossom of a rose tattoo design typically signifies balance or beauty. Again, if you think of the life cycle of the flower like your life, you've grown and changed. You've found the balance in your life. Then there is the wilting rose. This is the end of the life cycle and holds great symbolic meaning. A wilting rose can mean unrequited love, loss, and even death. Another level of meaning that you can add to your rose tattoo is thorns. That is because these little defensive looking elements can mean thoughtlessness, hurt, pain or loss. They contrast with the beauty of the flower and allow us to see that the beauty of the rose is only skin deep and there is more than meets the eye. Thorns surrounding a rose can even symbolize protection. On the opposite end of the coin, you have the thornless roses. These are symbols of hope. 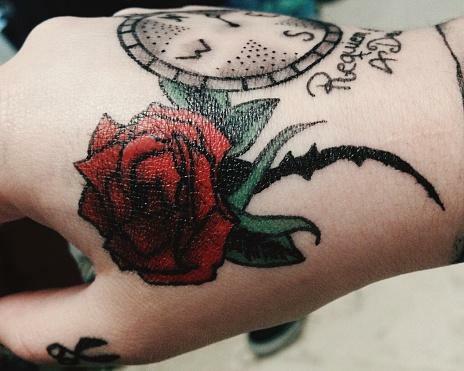 If you have a thorn-less rose tattoo, you are letting all your defenses down. You are showing the world through your ink that you will find hope in the world. Rose tattoos can come in singles or multiples, and depending on what you choose, each can hold a different significance. A single rose is a universal sign for love, but it could also mean respect, courage, apology, happiness, friendship, admiration or loss, depending on the color. Two roses could indicate romantic love, a deep friendship, or remember a lost loved one. They may also evoke a sense of unity of two people, or duality, depending on the wearer. Tattooing multiple or a bouquet of roses can also add to the meaning. For example, black roses are a symbol or grief or loss. Having multiple black roses could signify the loss of several people you loved. Not all roses look like roses and the style of your tattoo will definitely depend on your personal preference. There are tribal rose designs, black and gray, and full-color pieces. You can also find stylized designs that simplify the rose image. 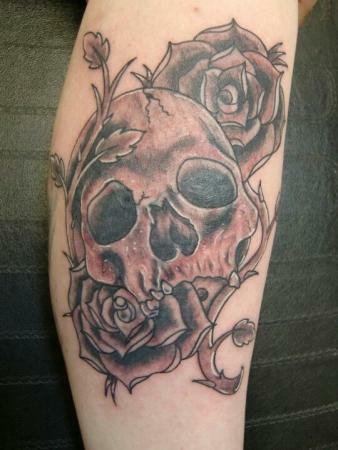 Rose and a skull: While you might think this signifies death like the black rose, the rose and the skull can also mean power or overcoming an obstacle. Butterfly and rose: This is a common feminine symbol that can represent femininityor beauty. Rose and a cross: Adding the cross to the rose can indicate your relationship with God or your devotion to Christianity. Rose with a heart: The rose and heart signify love or true love. They can mean enduring love or first love. Placement of a rose tattoo is quite honestly limitless. The styles and different designs that rose tattoos come in make them a versatile tattoo that can fit easily in the small space of your upper ear lobe or take up your entire back. It all really depends on what you are looking for. Single rose with stem designs can be made relatively small and fit along long areas of the body or wrap around. 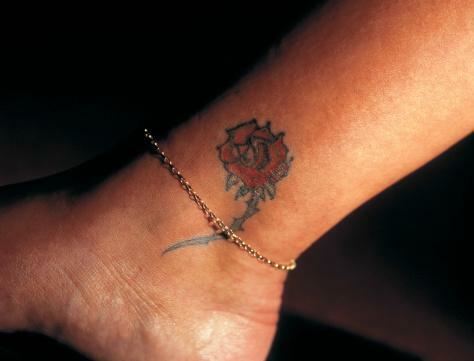 For example, a woman might place a single rose along her ankle or wrist. 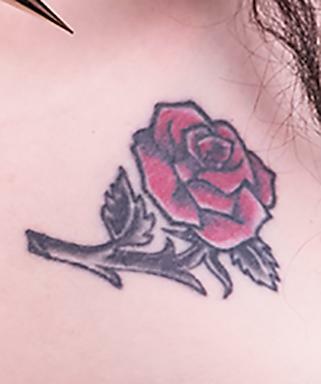 Although the neck can be one of the more painful places to tattoo, it is also a lovely area to display a single rose. This might also be joined to another symbol, such as a heart. These designs also fit really well along the collar bone and shoulder blade. A gentleman might get a rose tattoo on their bicep or calf. The forearm or hand is another great place for a single rose piece. Blossom designs are round and can fit great centered on the lower back or shoulder blade as well as the bicep or calf. 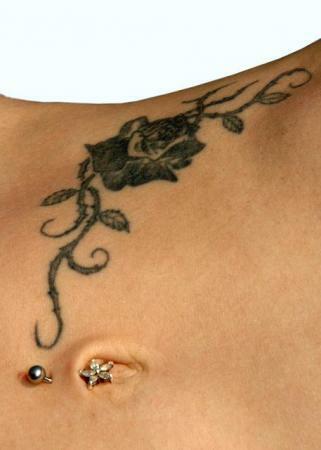 Above the ankle bone or foot are also a great rounded area for the rose blossom tattoo. Multiple flowers or rose bush designs take up considerably more space. While they can be made to work on a smaller area, a large area like the upper thigh, back and chest are best. If originality is important to you, take the time to seek out a tattoo artist who can create an original design. Browse the shop's website or in-store albums to make sure you like the artist's work. 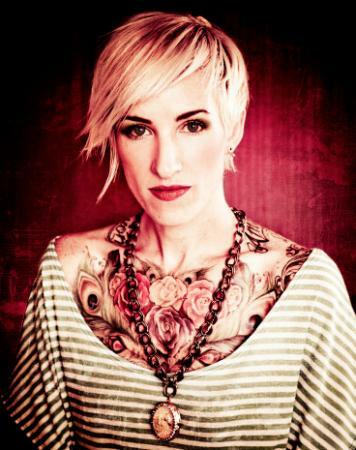 Then talk with the artist about exactly why you want a rose tattoo, what you envision, and what style you have in mind. You can also create a design yourself, have an artist friend do it, or bring in a photo of an image you like. A good artist will work with you to make sure your rose is beautiful and original. Roses are as diverse as the people that get them inked. Depending on what you are looking for, you can find the perfect rose to fit your theme of hope, rebirth, love or even death. This multifaceted design can fit just about anywhere on the body and looks right at home on both genders. So, find that rose tattoo design you've been eyeing and hit up your favorite artist.